According to the counter staff, this is Darcis’ only “shoppu” in the Kansai region, with one other “very far away” at a place which I could not remember in Kyushu! Not tokyo for sure if not I would have known. 🙂 The booth had only two things, macarons and chocolates. 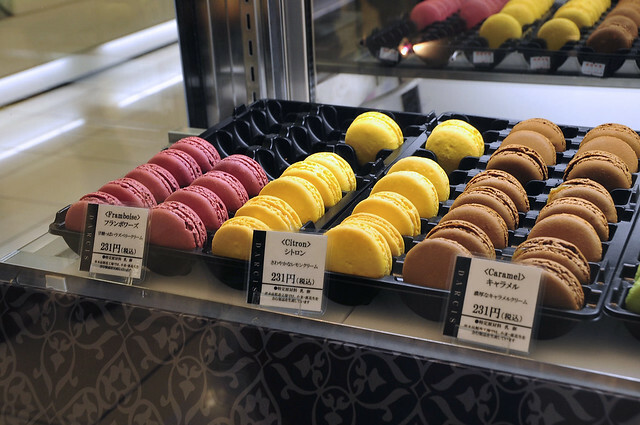 Out of the 15 flavours on Darcis’ macaron menu 9 flavours were available that day. 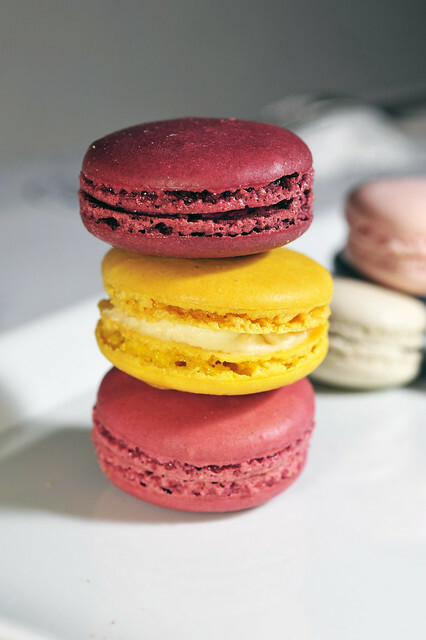 We brought back 3 flavours, namely from the top, Cassis Violette, Citron and Framboise as I’m partial to fruit-themed macs and always favoured tart flavours to those which would give the buttercream more lift and less heft. So blackcurrant, lemon and raspberry would be ideal. 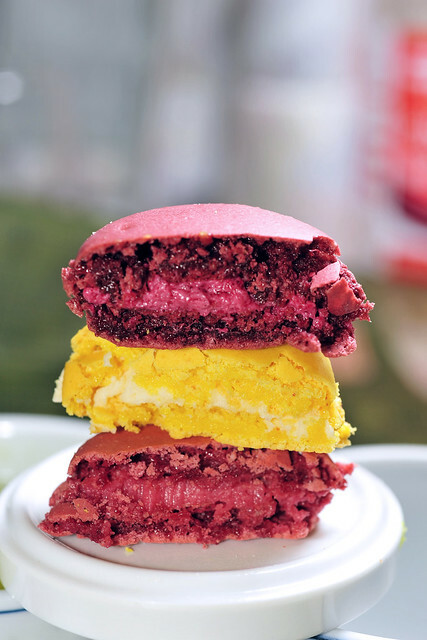 The macarons are quite sizeable and made using the italian meringue method. Shells were shiny with very decent feet. But that’s only to be expected I guess. The shells are by far the best we’ve had in Kansai. But how do they fair? First the cassis violette. Scores very high on aromatics. The shell has a very nice crunch to it and went very well with the blackcurrant-infused white chocolate ganache filling. I would have expected it to be very sour but no, it was much more tamed that what I had anticipated but very good nonetheless. The framboise too had very well-made shells. Very consistent texture and quality of coques. this tasted more delicate than the cassis violette and again, less tart than what I had hoped for. Perhaps it was done so to suit the tastes of the Japanese crowd. Citron didn’t shine as much as cassis-violette, hardly tasting of lemons at all with it being more sweet than astringent. once again, seemed like very “safe” moves made by the Belgian chocolatier. Didnt try the assortment of bonbons and pralines but I’m sure they would fare better than his macs. 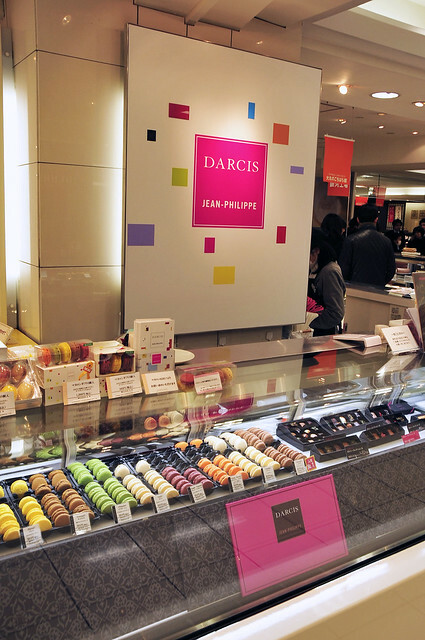 Darcis is afterall more known as a chocolatier than a patissier. But still, I think fared satisfactorily in the macarons I’d tried. Not the best but surely not the worst. We were absolutely famished after leaving Daimaru. Need to look for a place to eat and we had one listed on our itinerary, an old shop which is well-known for their grilled eel, unagi cuisine. We had a hard time finding the place but when we were there, we were shocked. The menu was way too pricey than what we had expected to pay for dinner. Thankfully there were other eateries nearby and we chose one which was more like a family restaurant. And we had unagi too! At a modest fraction of what we would have paid otherwise. 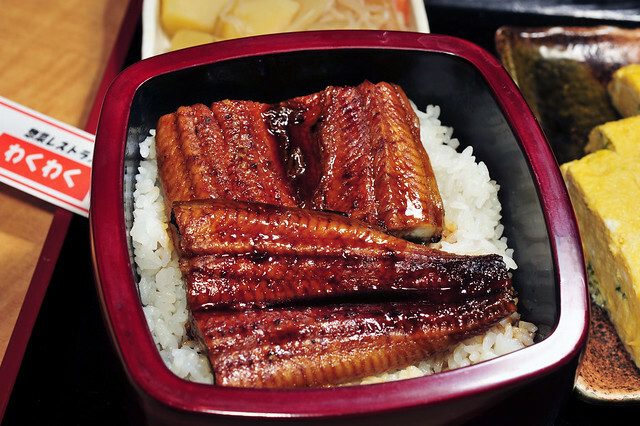 Unagi don, thick slabs of grilled freshwater eel glazed with kabayaki sauce. The latter is a concoction of mirin, shoyu and zatou in the ratio of 2:2:1. The sweet and savoury flavours accompanying the juices that oozed out was much welcomed for an empty and growling stomach. 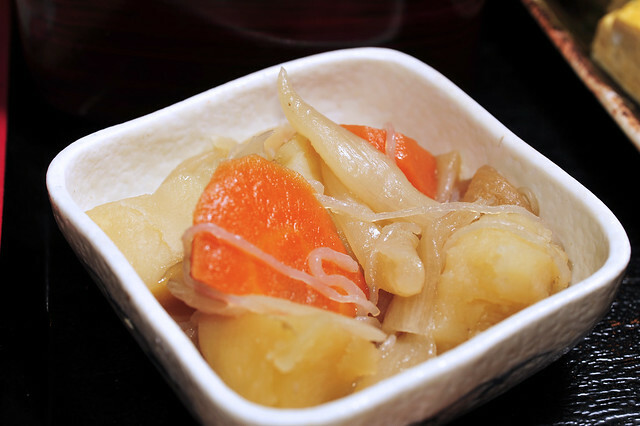 Potato and Pork Stew, a very “homely” Japanese dish known as “Nikujaga” which every Japanese housewife is capable of making. Its simplicity is so gratifying, especially with a piping hot bowl of rice. 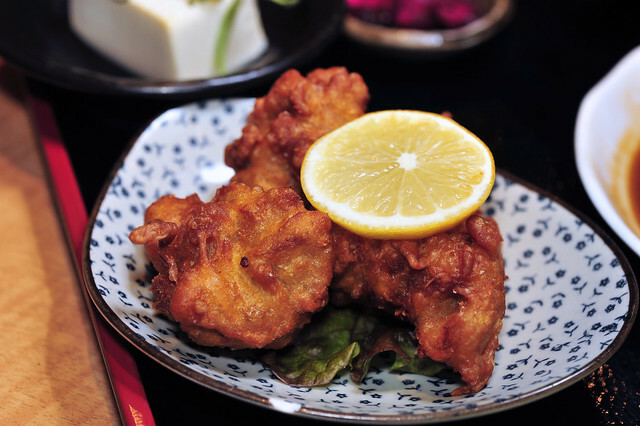 Tori karaage, chunks of fried chicken thigh meatmarinated with sugar, grated ginger and shoyu. pretty standard and nothing much to shout about. pickled vegetables to go along. I love this stuff! 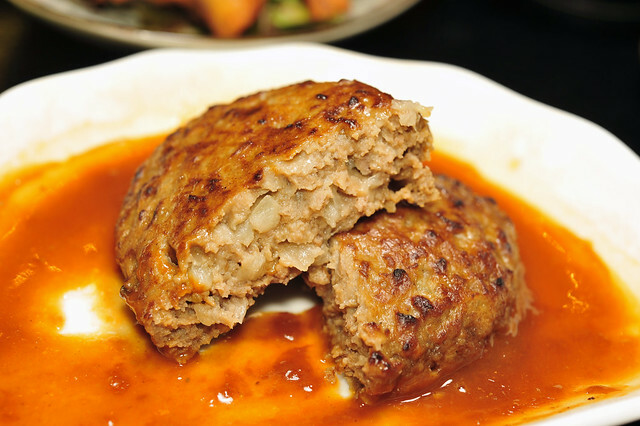 The highlight of J’s set meal, a very succulent hamburger steak. minced beef with onions and an assortment of condiments. Very juicy and tender. Not wagyu for sure but its good enough for me. Overall, a very delicious dinner without all that pretentious pomp and circumstance. A shop diagonal to the famous unagi shop in Kyoto. We would be back again, if we are in the area. This entry was posted on August 18, 2011 by Alan (travellingfoodies). 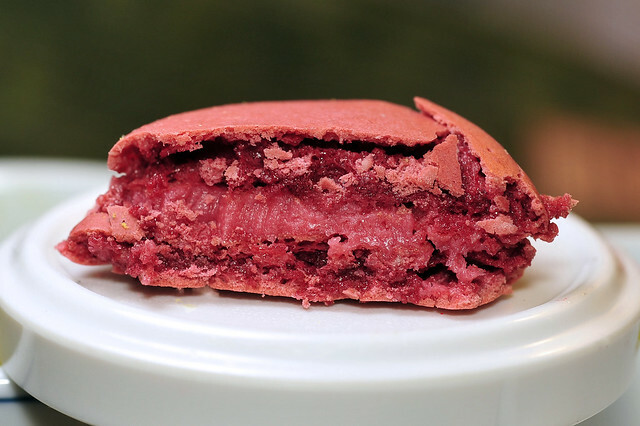 It was filed under Food, Travel and was tagged with citron, framboise, Japan, Jean Philippe Darcis, kansai, Kyoto, macarons, osaka, unagi don dinner, violette cassis. 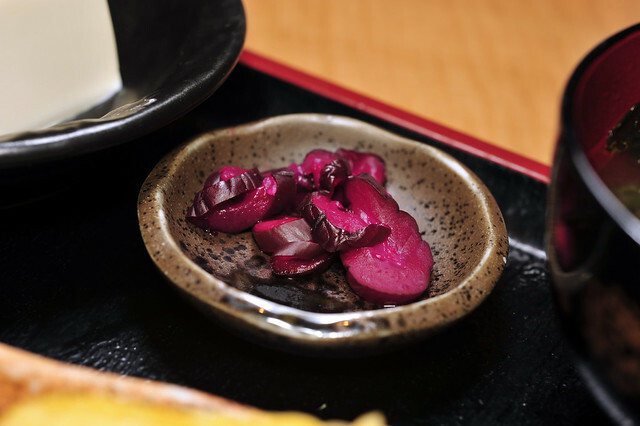 The dish in which the pickled veg are in… that’s just the type of dish I’m looking for! haha. 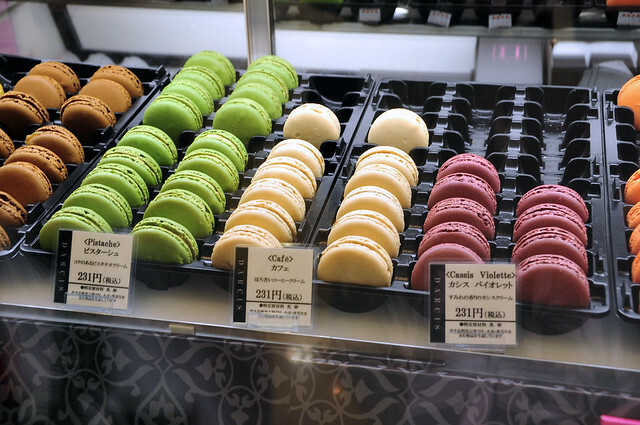 from the display counter, i think the violet macarons looks most attractive, the colour i mean. any idea what sort of picked vegetable is that? oh yeah, you know something.. i just spotted some mulberries in one of the local fruit stores and bought a pack home. They are actually quite small, not like the ones in see in the web..i wouldnt say that i love eating them..maybe it;s better to put in bakes. oh yes, i’m a very visual person too, getting easily swayed by something which looks pretty or striking. mulberries do come in certain varieties. i’m wondering if the tropical climate makes them grow and mature faster and thus not enough time to pack more into those teeny little droplets. They do taste quite acrid when eaten flat, oh yeah, better to put them into baking. So what do you plan to use them for?